On 3 May 2016, the life essence that was Larry L. Versteeg joined the universal life force that is called by many names, including God, after a short battle with lung cancer. He was in hospital, happily talking about his traveling experiences when his head quietly nodded forward and he left his painful world. During his 76 years of life, Larry was born in Corsica, South Dakota, schooled in the Vermillion, high school in Vermillion, S. D. and The University of South Dakota receiving his Bachelor and Masters degrees there. Larry was a director of bands in the Pierre Public Schools in South Dakota, the Sioux Center Public Schools in Iowa, and 32 years in the Glendale Elementary School District in Arizona. He was also a life-long 32nd degree Mason with his lodge in South Dakota. While a resident in Glendale Larry served his community by volunteering as a reserve police officer for thirteen years attaining the rank of Lieutenant and graduating from Glendale Community College with an Associate Arts Degree in Police Science. He began his musical career at a young age playing in dance bands around South Dakota, and later would annually tour with a traveling circus band. In Arizona he performed with many of the jazz bands in the valley including Crazy Ed's, as well as the Don Nicholl's Trio which performed at the Lakes Club in Sun City for 18 years. Larry would lead his own combo there for 4 years. He was a long time member of the Phoenix Federation of Musicians and he shared his talents as principal euphonium for 29 yrs. with the Arizona Winds Concert Band since its inception and as served on their Board of Directors as Vice - President for 5 years. He was also the musical arranger, valve trombonist and double-bell euphonium player for the Territorial Brass, Arizona's Official Historical Brass Band, and a member of the Two Balloons tuba-euphonium quartet. Larry loved to travel and particularly enjoyed France, Costa Rica and San Diego most often. Those who knew Larry will celebrate his life with their memories of a caring wonderful man. He leaves behind a brother LaMars (Bud) Versteeg who resides in Colorado and winters in Alabama, a niece Stefanie Pascal in Hudson CO, and a niece Stacey Upton in Capitola CA, and his friends in Arizona and San Diego as well. Services were handled by the Neptune Society and his ashes interred in San Diego Bay. Larry's family requests that donations be made in his honor, keeping his music and spirit alive, to Territorial Brass (a 501c3 non-profit organization), and sent to 523 N Macdonald, Mesa AZ 85201. 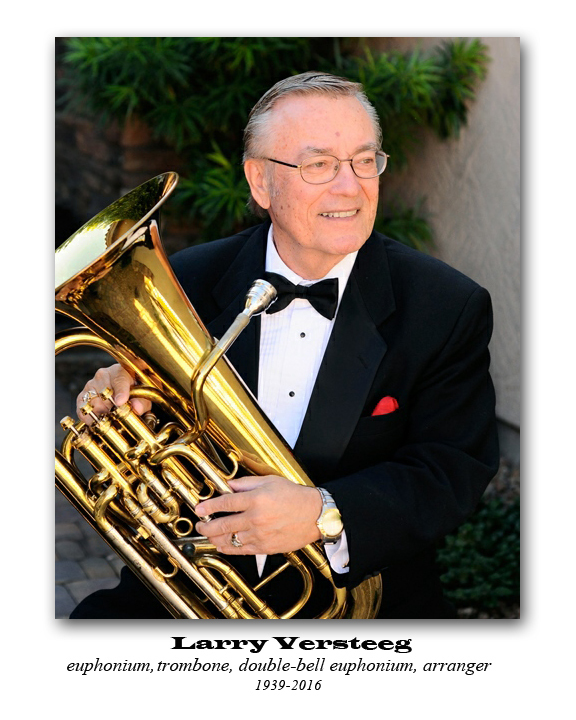 Your donation will directly fund a CD recording of Larry Versteeg arrangements.